Description: Features: Caliber: .416 Rigby. Magazine Capacity: 4 Rd. Fixed Mag. Includes 3-leaf express sights (1 standing 2 folding). Hammer forged barrel and single set trigger. Stock is made from select Turkish walnut and has a classic safari shape. 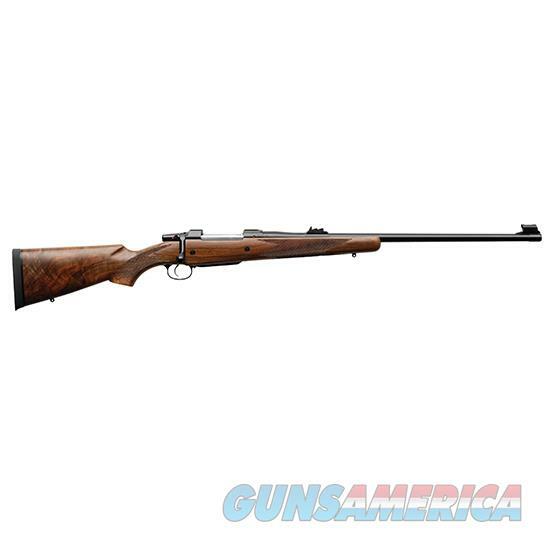 Known world-wide as the 602 Brno the CZ 550 Safari Magnum is a true full-sized magnum not a smaller action blown out to barely hold the cartridge with only 2 rounds in the magazine. On the contrary the Safari Magnum can hold 3 Rigbys in the magazine! The controlled round feed and fixed ejector make this rifle reliable enough for heavy and dangerous game.